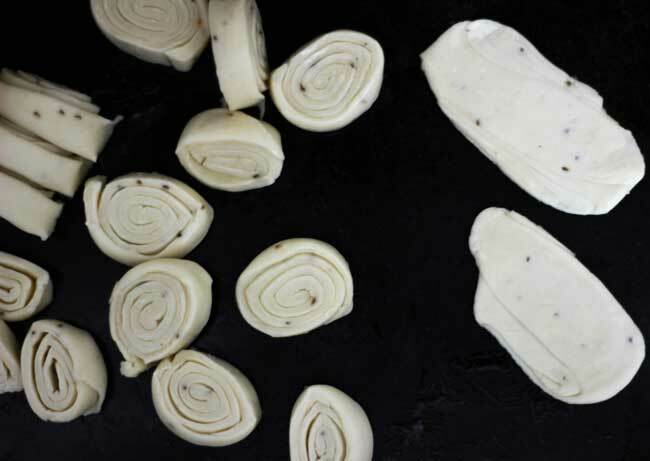 Nimki is a popular savory pre-make snack from the bylanes of Uttar Pradesh. Nimki comes in many flavors and forms. In many homes, it is shaped like a diamond and called namak para, while in many others it is neatly folded into a layered triangle. 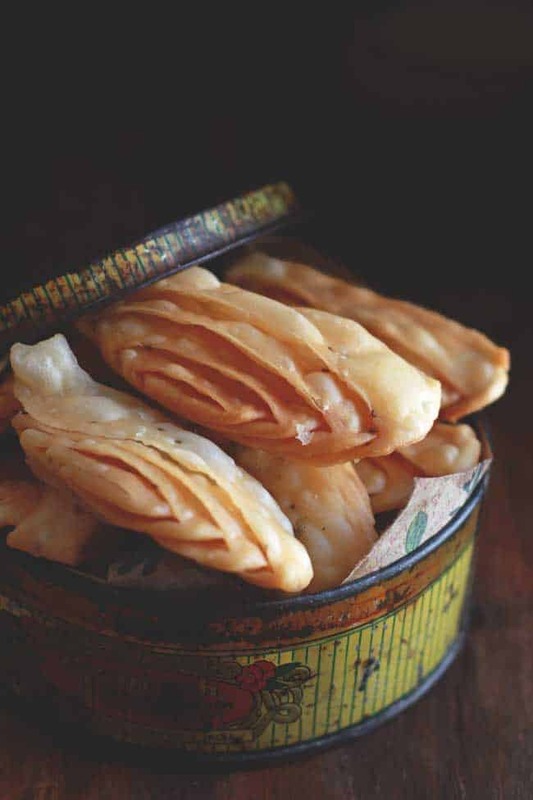 Whatever be the shape, Nimki is always crisp, crunchy and a favorite tea-time munchie for the festive season. 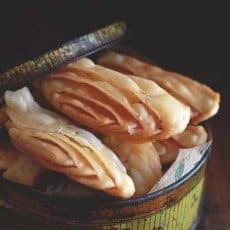 How to serve Nimki? There is only one answer, with your favorite pickle. Scoop out a generous helping of homemade achaar and serve it with Nimki. And not to forget garam garam chai. With this snack combination on the table, the chitter-chatter never seem to fade away. Or it lasts till the last piece of Nimki is devoured with the leftover masala of the pickle. Such is the magic of Nimki aka Indian style savory crackers. 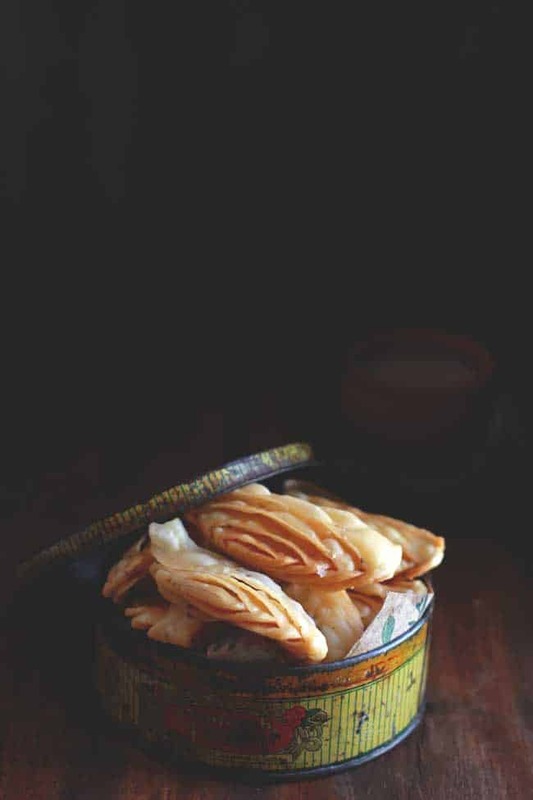 The post-festive season when there is a kind of weird quietness in the air munching Nimki remind me of the celebratory month gone. A large jar full of Nimki will last for a few days more post-Diwali. And then I would think of making a batch of it around Holi. There is no hard and fast rule that you cannot make these crackers in between but I always associate them with the festive celebration. 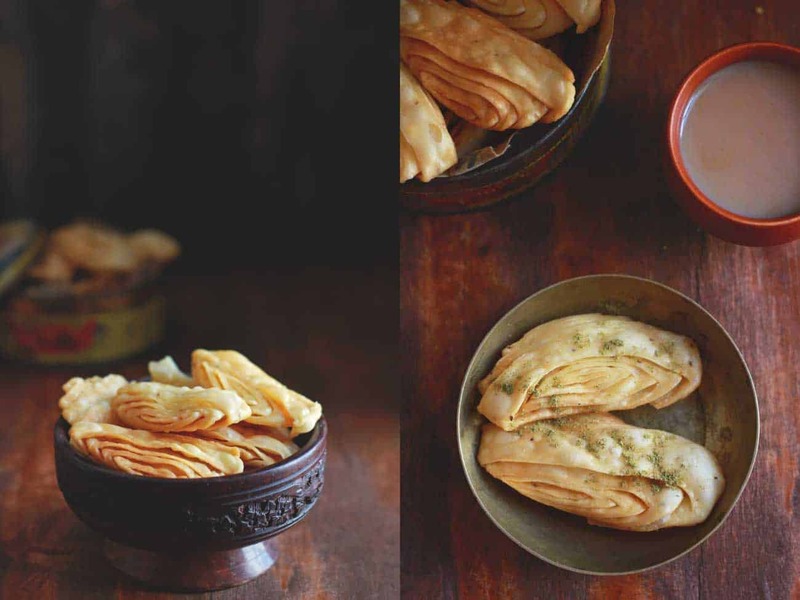 There is an old school charm in relishing these conventional snacks during the festive celebrations and sharing them with the loved ones. A week before the festival I set out on a pre-made snack making spree such as Nimki, Khasta Kachori, Mini Samosa, Masoor Dal Cutlet. The deep-fried aroma creeps into every corner of the house setting the merry mood. And announcing the arrival of the festive season. Combine flour, ajwain and salt together in a bowl. Using lukewarm water bind a stiff yet pliable dough. Knead the dough for 2 - 3 minutes. Allow the dough to rest for 5 minutes. Meanwhile, make a paste of cornflour and refined oil. Set aside. Divide the dough into 2 - 3 equal size balls. Dust the kitchen counter with a teaspoon or so of flour. Roll out one ball of dough into a giant chapati. Make sure not to roll out dough very thin. It should have thickness similar to that of a chapati. 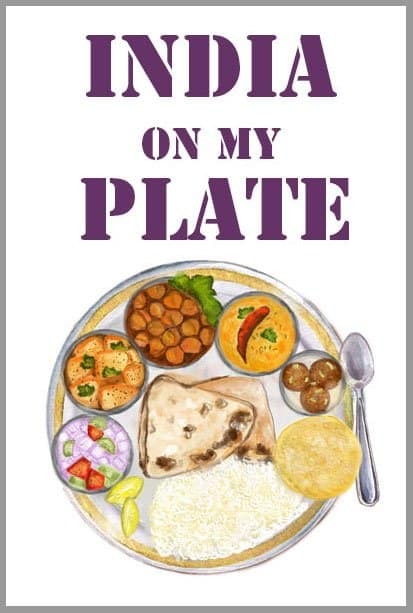 Evenly smear a spoonful of oil and cornflour paste over the chapati using your fingers. 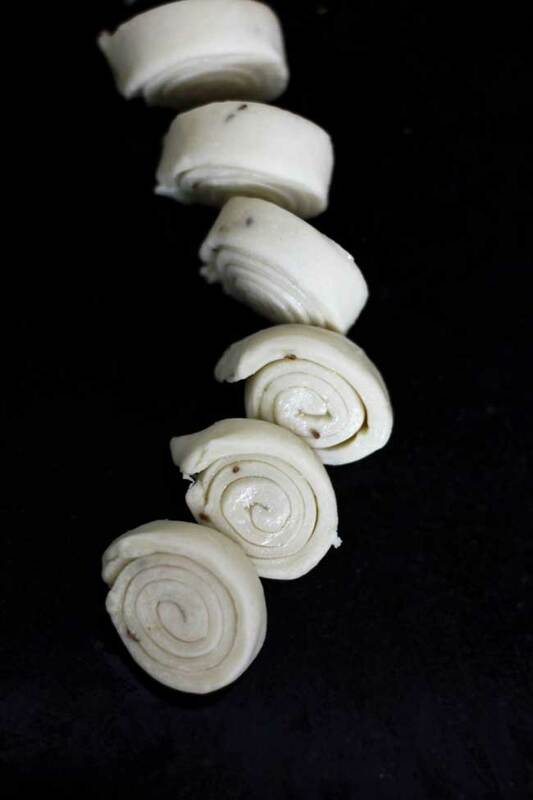 Beginning from one side, role up dough to form a long cylinder like shape (as shown in image) and press gently at the edges to seal. 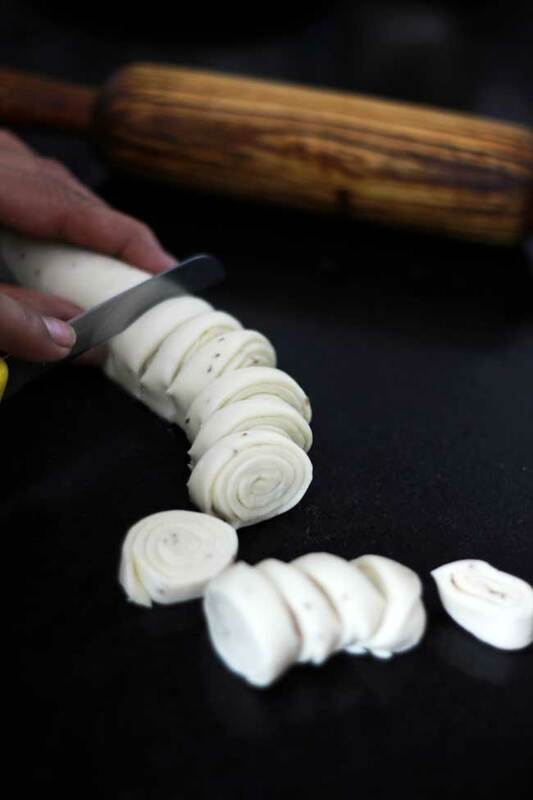 Cut the roll into 8 - 10 round slices (see image 1 & 2). Place one slice on the counter like a wheel in a standing position. Press gently with your palm and roll out into a oblong shape (refer to image 3). Similarly, shape all the crackers. This step is crucial to get the flaky layers in the Nimki. Heat oil in a deep-frying pan over medium flame. Deep fry the crackers in small batches over medium heat. Flip once they turn light brown and crisp from one side. Try to deep-fry the crackers in low-medium heat for better color and even cooking. Transfer to a plate lined with paper towel. Serve immediately or allow to cool and store in an airtight container at room temperature. How can you make it crispy without oil? The paste of corn flour and water spread in the layers make it crispy while deep-frying.